Borealis and Borouge, leading providers of innovative, value-creating plastics solutions are providing polyolefin-based material solutions to help meet the strategic challenges faced by original equipment manufacturers (OEMs) and Tier One suppliers in the automotive industry. Cooperation with OEMs and Tier One suppliers has both local and global dimensions as they work with industry partners and suppliers on site to develop innovative material plastics solutions while at the same time leveraging the global capabilities made possible by the companies' international reach. 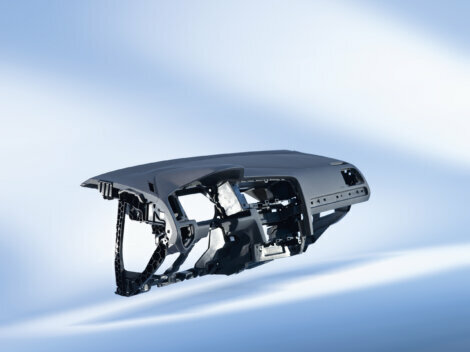 Three key polypropylene (PP) solutions – for instrument panel carriers, door claddings and bumpers – will be highlighted at K 2013 as clear examples of how working together helps Borealis, Borouge and their partners in the automotive industry realise their strategic aims. An excellent example of Borealis and Borouge's integrated approach to working together with both OEMs and Tier One suppliers is the October 2012 launch of the Volkswagen Golf A7. Working closely with VW project teams in Wolfsburg and key Tier One Suppliers, Borealis supplies three dedicated material solutions for interior and exterior components of the new model. Overall, these high-performance materials allow for the construction of parts with reduced wall thicknesses and contribute to weight reduction by lessening the amount of filler required without affecting part quality and performance. The grades also support new process technologies such as foaming technologies for high level mechanical performance at lower weight. The grade Fibremod™ GE277AI developed for the Golf 7 instrument panel carrier is a 20% short glass fibre from the Borealis and Borouge Fibremod family of highly engineered short glass fibre (SGF) and long glass fibre (LGF) PP compounds. Here, customer demands on the material were ideally fulfilled by Fibremod GE277AI: high flowability paired with high stiffness and impact ratio, easy processability with high flow lengths and low wall thickness, high dimensional stability and weld strength. What is more, the new VW structural foam injection moulding process (SFIM) was optimally served by the ideal foaming properties of Fibremod GE277AI, which allow for high foam degrees and enable homogeneous cell sizes. For door cladding, Daplen™ EE189HP was developed in accordance with stringent customer material specifications. A 15% mineral-filled PP compound, Daplen EE189HP allows for fast cycle injection moulding of complex interior parts. The grade also exhibits high scratch and abrasion resistance. Another clear advantage to the customer is the high level of integrated functions such as a loudspeaker grid in a pleasing new aesthetic design. Finally, the material is fully UV-resistant and non-sticky equipped. Delivering the ideal solution for the Golf 7 bumper was facilitated through close cooperation with a key Tier One supplier. The thermoplastic polyolefin (TPO) compound EF155AE results in lighter overall weight thanks to reduced filler content. Its good flowability means lower injection pressure is required, causing less tool wear and consuming less energy. In line with the industry demand for lower gap tolerances for bumpers, EF155AE boasts a low coefficient of linear thermal expansion (CLTE) for zero-gap bumper. EF155AE provides excellent impact/stiffness balance, pleasing surface aesthetics and ultimately fulfils stringent customer specifications. Jost Eric Laumeyer, Borealis Global Marketing Manager Engineering Applications, is pleased with the results of collaboration on the Golf A7. "We are proud to present our material solutions for Volkswagen's best-selling model worldwide, the Golf, at this year's K-Fair. The projects for key applications on the Golf that we have realised thus far reflect the true value of a close, long-term relationship with the OEM as well as the Tiers," he continues. "We look forward to developing further innovative, tailor-made solutions in polypropylene together." Cooperation with OEMs and Tier One suppliers must have both global and local dimensions to achieve and maintain success for all sides. Leading OEMs require cutting-edge material solutions to fulfil ever more stringent performance and cost efficiency standards in all areas of the world in which they manufacture vehicles, and particularly in the markets of Asia and South America, where demand continues to rise. Consequently, Tier One suppliers must also be able to produce plastics components for assembly lines around the globe. "As global partners to the automotive industry, Borealis and Borouge provide tailor-made material solutions for global markets from Europe to the Middle East and China, as well as both South and North America," states Harald Hammer, Borealis Vice President Engineering Applications. "Borealis has a clear growth strategy for North America and has in fact started to localise grades in the regions in which they are now commercially available." Borealis and Borouge will highlight their innovative PP materials for the automotive industry at the K 2013 trade fair in Düsseldorf, Germany, Hall 6, Stand A43, from October 16-23, 2013.